On this particular day, I wanted to take a photo of a certain scene, but it happened to be raining since the morning; so I just stayed and relaxed at the hotel waiting for the rain to stop. However, it continued raining into the afternoon, and as I looked out on to the surrounding mountains, I was unable to see any breaks in the clouds. According to the hotel staff I had become friendly with and the guides and boatmen I had talked to, the best time to visit the location to capture that scene seemed to be just after 3 p.m. It took about 30 minutes to get there from the hotel by boat, so I wanted to set out for the location at least by 2:30 that afternoon. The rain started to ease up a little just after 2 p.m., and as the wind was slowly blowing the clouds from south to north that day, I could see the southern sky begin to brighten. 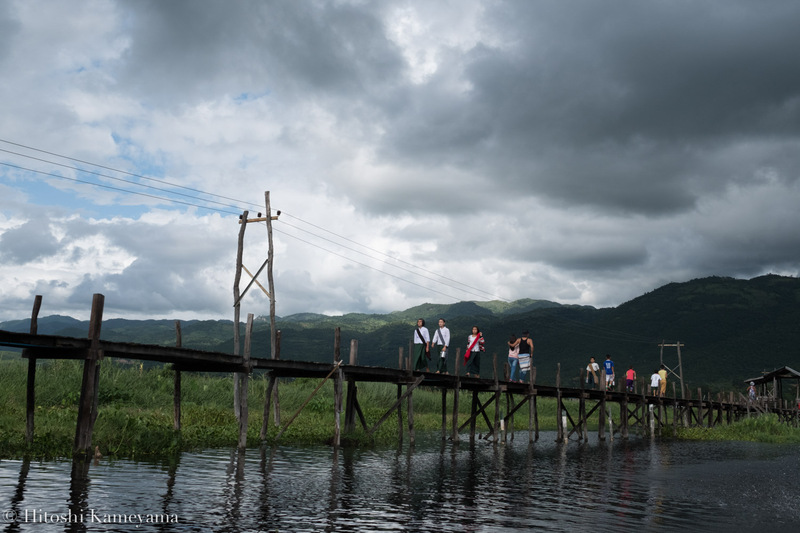 Even though it was still raining lightly, I headed out from the hotel at the last minute, at 2:30 p.m.
My destination was a 500 meters long wooden bridge in the village of Maing Touk on the shores of the Inle Lake. I heard that this is the only bridge of its kind stretching over this expansive lake. The guide told me that although the lake’s water level varies by several meters between the wet and dry seasons, the level change was even larger in this area compared to others for geographical or similar reasons. Since the local people use boats to get around the lake area, a former village chief was especially adamant that this bridge be built. Even though this bridge cannot be found in any guidebook, it has become somewhat of a well-known tourist attraction within Myanmar. The boat stopped on the lake near the bridge just after 3 p.m., and as I waited there, a group of children who had just finished school came walking to the lake. There was a fairly wide jetty at the end of the bridge, where the children would get on the boats to return together to their villages. First came the students of the lower grades of elementary school, followed by those of the higher grades and finally the junior high school students. Even though the jetty had no fences or handrails, the children ran around innocently without a care in the world. While watching, I couldn’t help but feel anxious that some of them might accidentally fall in the lake each year. It is said that such bridges will become a thing of the past, as development around the Inle Lake area surges ahead. For this reason, I could not miss the chance to preserve on film the scene of these children walking happily by the lake.